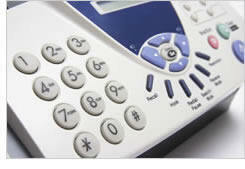 Integrate Fax Machines to VoIP. Introducing a new way to connect fax machines. Connect fax machines to premise based fax servers to get more features. Connect fax machines directly to VoIP providers with HTTPS for true reliability and security. Finally, a reliable way to connect fax machines to VoIP. The new Fax ATA uses HTTPS to securely send faxes in real-time over any data connection (Internet, Cellular, and Satellite) and delivers new features and functionality to the fax machine including automatic fax archiving and email notifications. FaxBack's Fax Machine Solutions for VoIP are designed from the ground up to meet today's business VoIP and Internet connectivity requirements. Enables companies to connect fax machines to a premise based fax server or to a VoIP provider. FaxBack Fax Machine Solutions add features to the fax machine similar to how VoIP added features to the phone: receive fax notification via email and track, archive and manage faxes through the fax server or service provider control panel. Uses any type of Internet/data connection (Satellite, Wi-Fi and Cellular data connections). and evaluation the solution in your business environment.